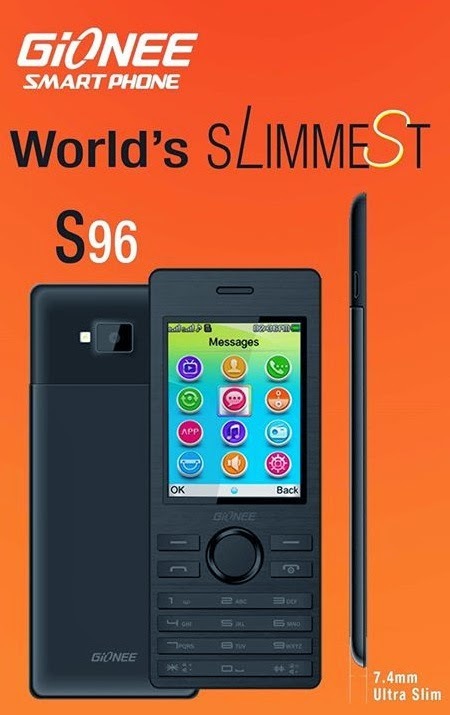 Gionee S96 grabs the worlds thinnest feature phone title. In today’s smartphone-dominated market, it is unusual to find this kind marketing stunt in terms of feature phone branding. But this phone is worth a second look in terms of hardware and specs. Specs-wise, it won’t offer much to the table compared to entry level smartphones in the market. The Gionnee S96 is suited to be you second-tier phone with its 2.6-inch QVGA screen, 8MB of RAM and 16MB of internal memory that is expandable up to 32GB via microSD slot. It’ll run with MediaTek MT6260 and will have Java OS to play the whole show. You’ll get this puppy with a 700 mAh Li-Ion battery underneath its stainless steel chassis. This 7.4-mm candybar phone is strategically priced at Php 1,799. Check out the rest of the specs below.